Why is my DS18B20-PAR not picked up? I have had a DS18B20-PAR for some time and have often used it without a problem until now. Yesterday it just suddenly stopped working. I was trying to use it along with two i2C sensors at the time. I don't really know of anything which could have fried it, though. Edit: It is turning out much more complicated than I thought. I can't ever get it to work on pin 10. The sensor sometimes works on other pins (3, 9 and 11), but it often does not. I can still use pin 10 to blink and fade an LED, and receive input from a button, but it never picks up my DS18B20-PAR. What is happening here? 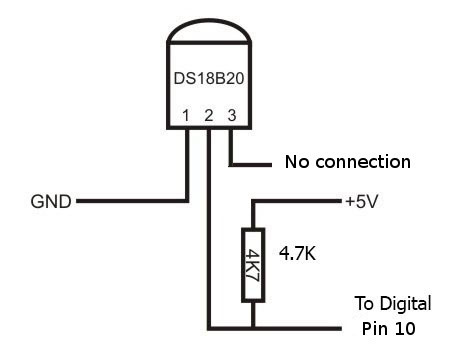 Please note that on the DS18B20-PAR the third pin is internally not connected. On the serial monitor is just prints "No more addresses." every 250 milliseconds. If the setup worked fine and then stopped, you must examine what changed. If your code is unchanged then it could be your sensor or your Arduino. You can try putting the sensor on a different input pin and update the code accordingly. You can try the sensor on a different Arduino or a new sensor if the same type on your Arduino. These are the first steps to troubleshooting. Not the answer you're looking for? Browse other questions tagged arduino-uno temperature-sensor or ask your own question.